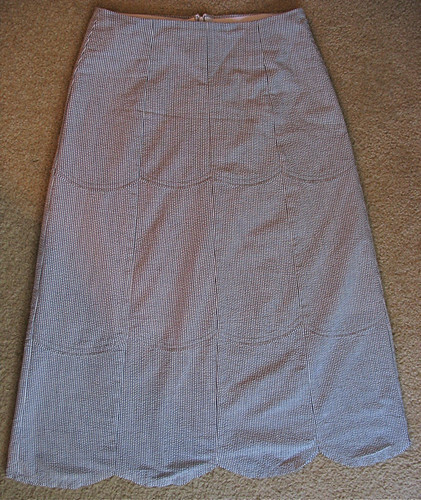 My new favorite skirt - Stop staring and start sewing! Okay so here's my post on the new skirt pattern I was telling you about and I love love love it! 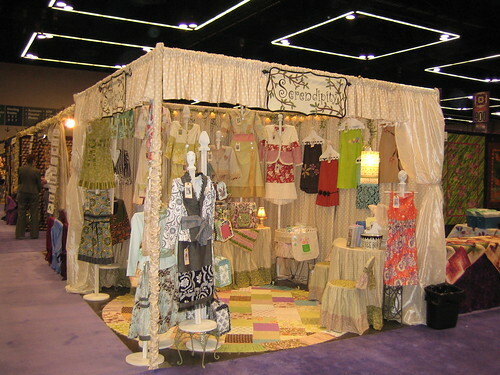 The designer is Kay Whitt and I met Kay and her husband Keith at Quilt Market. 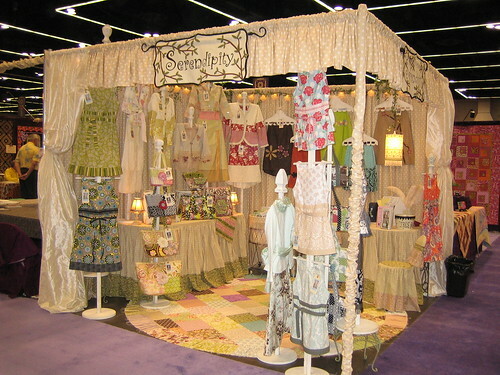 They had such a pretty booth and I kept going back to it because her designs were just so dang cute (casual yet classy) and they are such nice folks. Kay taught school for 9 years while sewing on the side until she finally said "I'm tired of you kids! I'm going to go sew!" Oh wait, that wasn't Kay. That's what I say everyday. Anyway I was kicking myself for not getting pictures of her booth but she was gracious enough to send me some to share. Here's another view. They had this gorgeous floorcloth made from different designer fabrics and I felt guilty walking on it until I overheard her telling someone she had scotch-guarded it so it was fine. And I kept going back and it looked clean each time so there you have it! 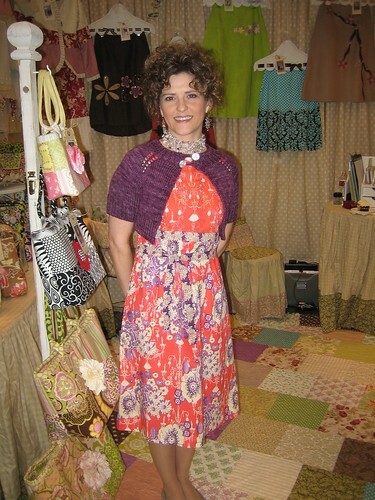 Here is Kay wearing her tunic dress (I'm working on one right now!). She's from Texas and after I got of the phone with her the other day I was walking around saying "ya'll cut that out!" to the kids. Those accents can be pretty contagious. I snapped up a bunch of her patterns at market and couldn't wait to order them for my shop but I wanted to try one first. Here's mine. This is the Tiffany skirt but I ordered 4 other skirt designs and 2 handbags as well. In the instructions she recommends using a fabric you're not crazy about on your first go-round. So I used this seersucker I got at the thrift store last year and I think it turned out great. I ADORE the scallops and it was really a fun pattern. 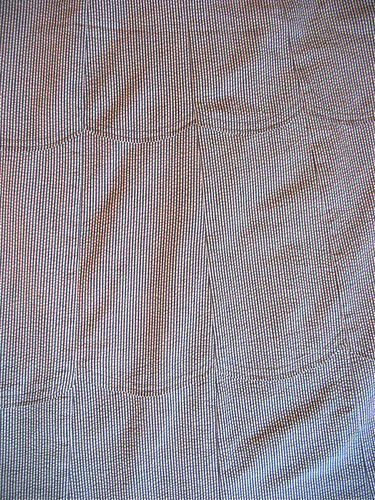 I used an invisible zipper and it went in quick and easy using this tutorial (which I have printed and keep in a file near my sewing area). Nice. Here's an upclose look at the scallops. And here's the whole thing. It was so easy to make it fit perfectly because it essentially has 8 scalloped panels and when I was done sewing them together I just tried it on then made small alterations, tried it on again, etc. until it was perfect. 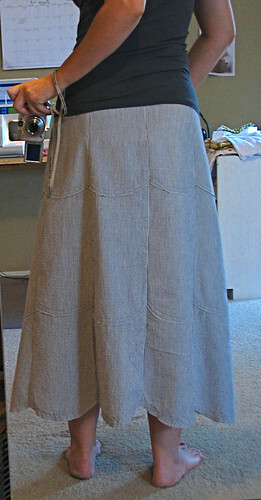 Then I made sure the facing was adjusted to fit the changes on the skirt and added that and voila'! 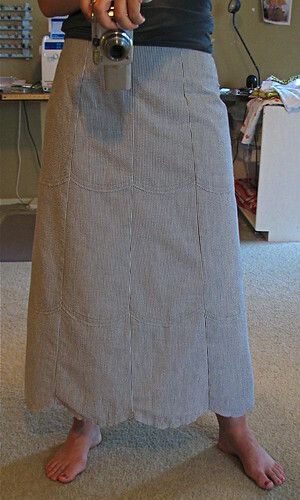 I will be making a lot of these for summer because skirts are perfect in the Arizona heat. Fun!